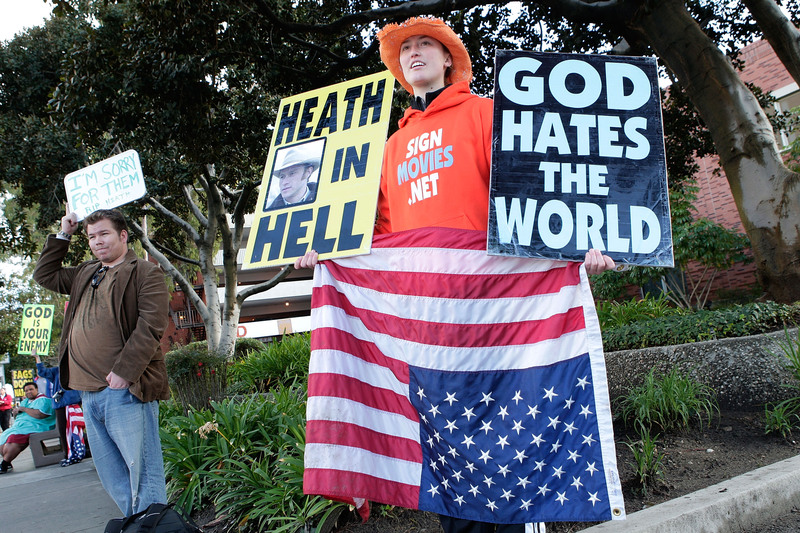 Extremist religious group Westboro Baptist Church (yes, that website url is www.godhatesfags.com) is known for doing some pretty upsetting stuff, like protesting at funerals and indoctrinating children with hateful views. But for a group that boasts such archaic views, they're certainly making an interesting place for themselves in 21st-century social media. The WBC's Twitter account, which boasts over 18,000 followers (including users like "Fags Doom Nations") uses its character limit to relay some unsurprisingly offensive bits of propaganda. But perhaps the WBC has found their social media calling with Vine, where their unintentionally hilarious but still upsetting videos were created "out of true love for God & our neighbors, to warn you with signs & songs that your proud, unrepentant sins bring God's wrath. Be reconciled to God!" Some may not find the purposely offensive and hurtful clips funny, but it's hard to believe that this isn't a parody account in any way, and that people can actually be this intolerant. As Rich Juzwiak from Gawker writes, "They're so ridiculous, so over-the-top, that to my mind, they generally qualify as camp, and anti-gay camp is a deliciously oxymoronic concept." The WBC account also re-vines accounts like "God Hates Fags" and other individual WBC members that are prepping to picket or trying to make a point about the Bible and our troubled society. And of course, there are some unexpected surprises, like this "Doom to the World" Christmas post. It's hard to believe that in 2014 people can still be so bigoted (although these Vines make them come off as pretty ignorant). Laugh as much as you like, but don't forget, "Destruction is Imminent."